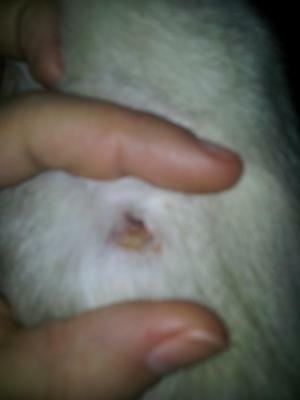 My 6-month-old male Ragdoll cross has a scabby sore on his shoulder blade. Most days it's scaley and scabbed up but other days it's weeping and open. I've spoken to people I know and they've said it could either be a bump/scrape or a ringworm. I don't think it could be a scrape as it's shape is quite round and he is a lazy indoor cat so I don't think it is possible for him to have hurt himself. I just want to know if this is worth worrying about because I don't want to take him to the vet for nothing. Could this be a ringworm? Yes, the lesion that you describe on your cat could be ringworm… or any of a number of other potentially problematic diseases. It would be best if you got him in to see a veterinarian for diagnosis and appropriate treatment. As you probably know, ringworm is contagious and could spread within your household to other animals and even to people. Hopefully, that is not what you are dealing with, but if it is, the sooner you get your cat started on treatment the less likely it is that you’ll have to deal with an outbreak in your home.